(1964) Steve Reeves, Genevieve Grad, Rik Battaglia. 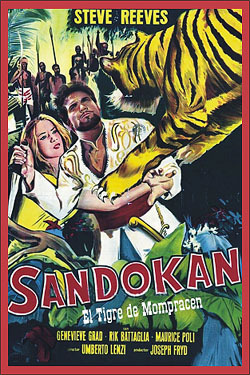 After the Sultan of Muluder is captured, Sandokan (his son) leads a band of warriors through the steamy jungles to free him. Reeves first appearance as Sandokan is a good one. Ray Danton would later take over the role. Color, scope, 35mm.